Ngati Pakeha Tiki are a celebration of being Pakeha in this country. These artworks say that the Tiki is ubiquitous in all that we do, no matter where we travel. Ngati Pakeha Tiki come from a line of work I was painting in the early 2000s. They are updated and printed but the longevity of the acceptance and love of them speak to a deep trust and joy. They say that everything in the World now has a little of New Zealand-Aotearoa in it and acknowledge that Tiki all have a little of every part of the World in them. While a play on the plastic Tiki of the tourist trade, these artworks invite us to hold a special place in our home for our nations developing cultural identity. 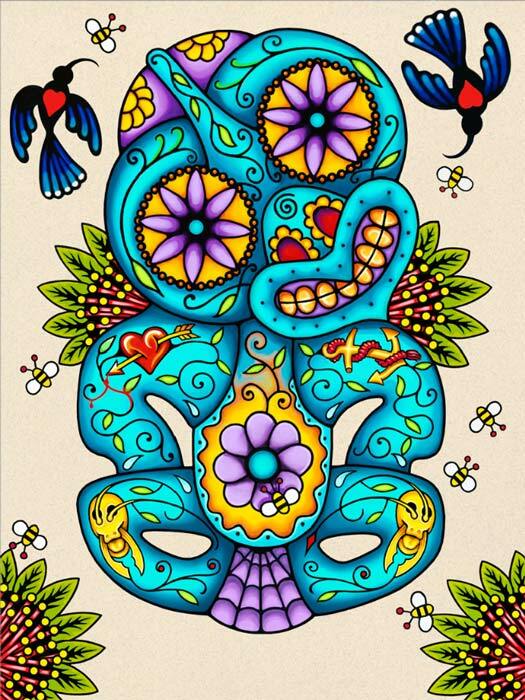 Tiki were and are fertility symbols and still today my adaptations might be seen to represent the fertility of the ethnic mix here in Aotearoa and in deed the whole of humanity so here I mix one the World’s love of the Mexican Muerto styles for the dead.... muchos gracias amibros.